This page contains a set of 67 concept (clicker) questions with answer key on the topic of waves, available for free download in Power Point or pdf format. It is a PhET Gold Star award-winning resource, developed for use with PhET interactive simulations on waves. Concept questions are intended to introduce a topic and probe students' existing beliefs prior to formal instruction. Students discuss their viewpoints, then "vote" on the correct response to the concept question. The use of concept questions has been extensively tested by physics education researchers and correlated with improved learner outcomes. 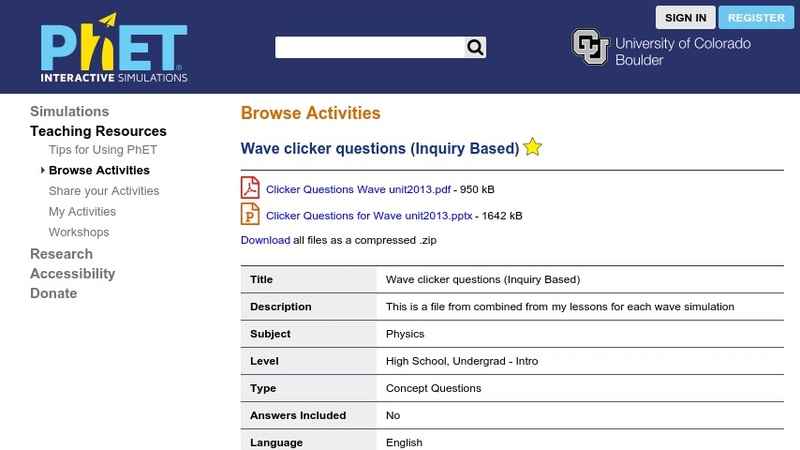 The clicker questions were created specifically to supplement the following PhET simulations: Fourier: Making Waves, Sound, Wave on a String, Wave Interference, Geometric Optics, and Resonance. This resource is part of a set of teacher-created materials developed to supplement the PhET collection of interactive physics simulations.